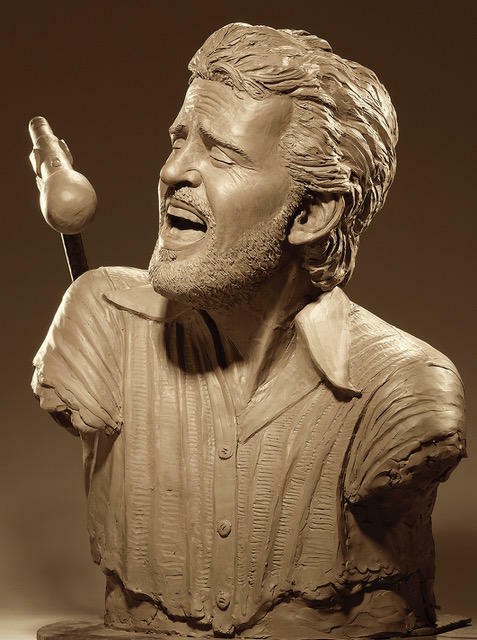 A bust of Levon Helm, created by artist Kevin Kresse, which is to be bronzed and placed in downtown Marvell, Arkansas. A fundraising campaign has been launched to create a permanent memorial in east Arkansas for Levon Helm. The legendary drummer and singer, who was best known for his work with The Band, grew up in the Phillips County community of Turkey Scratch, helping his family pick cotton. 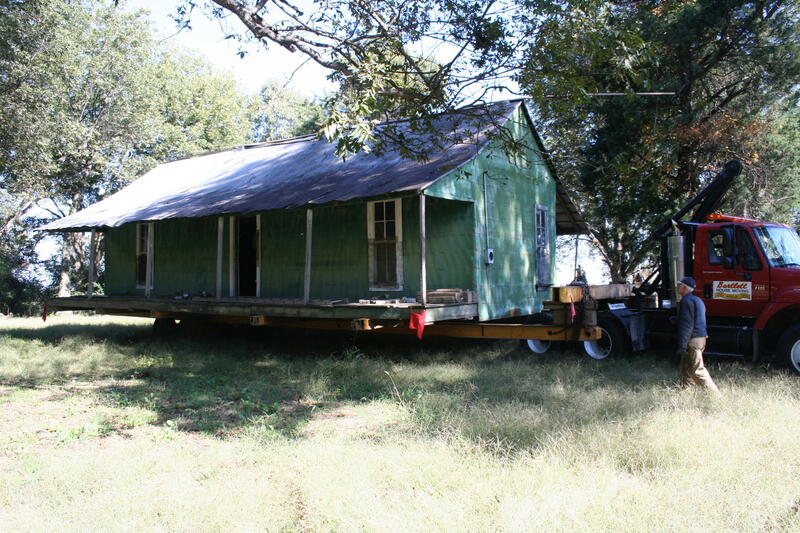 Plans are to finish restoring the sharecropper's house his family lived in, which has been moved to the nearby town of Marvell. A statue of Helm is also to be completed and placed downtown. The goal is to create a place for fans to visit who travel from around the world to see the area that shaped the young Helm. "They come from overseas, Japan, Norway, everywhere," said Helm’s longtime friend Anna Lee Amsden who is helping lead the project. "We’d like to finish remodeling the house, we’d like to get the statue bronzed and have a place where people can come," she said in an interview with KUAR. "Even when the house has been moved twice, they go out and have their pictures made of his old childhood home and at Turkey Scratch." The house Levon Helm's family lived in when it was recently moved. Helm, who died in 2012 at the age of 71, said he wanted to become a musician at the age of six after seeing a performance by bluegrass pioneer Bill Monroe. By 12 he was performing locally and by 17 got his big break when he was invited to play with the backing band for rockabilly singer Ronnie Hawkins. Members of the band later went on to perform with Bob Dylan and eventually emerged on their own known simply as The Band. Amsden first went to grade school with Helm and says it’s an honor to have a role in something that will serve as a tribute to him while also benefiting the area. "We’ve known each other all our lives and it’s just a labor of love on my part and to help bring the legacy to Marvell, which will create a permanent memorial," Amsden said. "It’ll help Phillips County, the tourism, hopefully a lot of kids that don’t get a chance to play music. We’re just trying to keep it going like he asked us to do." Amsden was immortalized by Helm when her name was included in the hit song "The Weight." In the lyrics, Helm sings "Well Luke my friend, what about young Anna Lee?’ He said, ‘Do me a favor son, won’t you stay and keep Anna Lee company." When asked what that has meant for her life, Amsden responded with a laugh, saying "It’s wonderful. I’ve met a lot of people that, because of the song, they just embrace me right away. I told Levon one time--as a matter of fact in October before he passed away in April--I went up and I said, 'you know, I don’t mind riding on your coattails because I have met some wonderful people through him." Helm was diagnosed with throat cancer in the late 1990s and in the following decade performed regularly during "Midnight Ramble" concerts at his home and studio, known as "The Barn" in Woodstock, New York. It was a time when Helm enjoyed a resurgence in his career with the release of the 2007 album Dirt Farmer. Amsden attended many of those shows. "I cooked for all the musicians who came to the ramble for seven months and it’s just great. People come up and they recognize the name and say, 'I’ve known about you for 40 years' and it’s really just a good feeling," Amsden said. The statue to be placed in downtown Marvell was created by sculptor Kevin Kresse of North Little Rock. "I’ve actually pretty much finished the bust, so now it’s raising the money to have it cast in bronze," said Kresse. "Its been a real, real honor for me to do such an Arkansas icon and Levon’s... his authentic nature, his soul and the passion that he had, the love he had for music, trying to get that into a piece has been a real joy and a challenge." A key part of that challenge, he says, was deciding what era of the musician’s career to portray in the bust. It was eventually decided to show Helm as he appeared in the 1976 documentary film of The Band’s last performance, which was directed by Martin Scorsese. "We talked a while about what age to depict him because he… it’s not like he stopped, he was still doing great work toward the end of his life, but they kind of settled on that, really The Last Waltz which was where I was getting a lot of visual information from because I was also able to get a lot of different angles and quality shots and stuff like that," Kresse said. The statue shows Helm singing with his mouth open, eyes closed and a microphone and stand over his shoulder. "I’m glad we settled on this one. I think it’s unique as well. I don’t think I’ve ever seen a bust of someone singing, especially like this," Kresse said. "That trademark look of his, putting up that one shoulder, turning to the right, drumming and singing at the same time, that's classic Levon Helm." After several years of planning, the Levon Helm Legacy Project announced Wednesday the launch of a GoFundMe page to accept donations for the project. More details, including how to make a contribution, can be found here.